Max Michaelis has launched a unique and very different physics gadget over on the Kickstarter crowdfunding website this month called the Halitron which is looking to raise £50,000 in funding. The Halitron has been specifically designed to experience horizontal levitation, and is sure to be fascinating to anyone interested in the laws of physics says its creator. 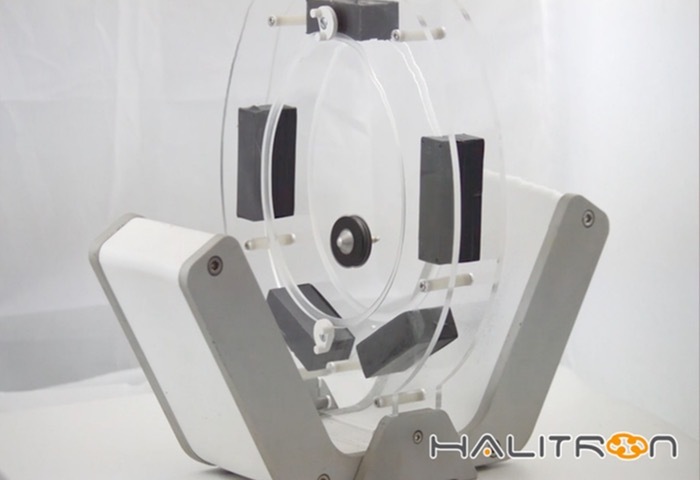 Watch the video after the jump to learn more about the Halitron project and see it in action. “We’ve been developing The Halitron over several years, with each iteration providing further insight into the world of magnetic traps. The Halitron™ not only displays a fascinating phenomenon, but the physics concepts that it demonstrates are relevant across many different fields, including space science, particle physics and MRI technology. With your help, we’re giving the Kickstarter community the opportunity to be the first ever people to own one of these by producing an exclusive Kickstarter only edition of the Halitron, so that you too can experience its mesmerizing effects and experiment at home with this unique gadget. The design has evolved over the years, increasingly becoming both more precise and user friendly. When Max first started the focus was in proving a theory that many people had said was impossible to prove. After Max created a prototype that proved it was possible he then worked with Isis Innovation, the University of Oxford’s commercialisation company, through their SME Smart IP Scheme to develop the Halitron further. They then teamed up with a local design and engineering consultancy, Oxford Product Design, to create a design that is even easier for people to use. For more information on the new Halitron jump over to the Kickstarter website for details via the link below.